The Council of African Independent Churches (CAIC) says it is contemplating laying criminal charges against a Johannesburg-based pastor who claimed to have raised a man from the dead on Sunday. 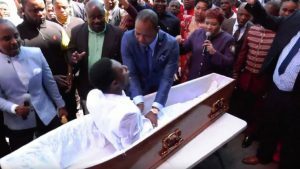 A video showing Pastor Alph Lukau of Alleluia Ministries went viral on social media after he claimed to be praying for a dead man who then resurrected. The church claimed that the body came straight from the mortuary to its premises. However, the funeral parlour whose vehicle was used to ferry the alleged deceased man to the church, has dismissed this as a ‘hoax’. CAIC’s Deputy General Secretary, Bishop Thami Ngcana, has labelled Pastor Lukau’s actions as blasphemous, saying the incident was staged. “The reason I say this is blasphemy is the manner in which it was staged. The so-called resurrected person was prepared, making him the modern day Lazarus. The Council of African Independent Churches wants to have this act of blasphemy criminalised. We are contemplating opening a criminal charge against him because we believe that through this act, it may lead to people believing that their dead will be resurrected and things like that. This is an emotional attack on the community and it must be dealt with harshly,” says Ngcana. The post Council considers laying criminal charges against Lukau appeared first on SABC News – Breaking news, special reports, world, business, sport coverage of all South African current events. Africa's news leader..